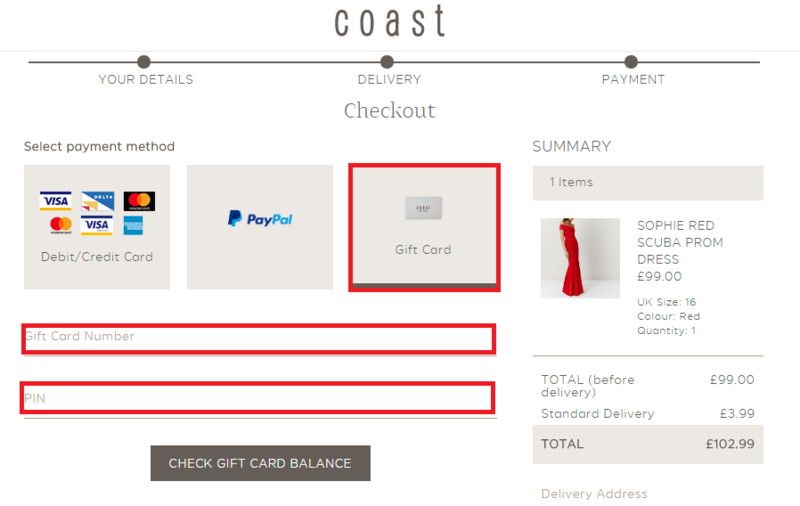 Check the balance on your Coast Gift card online by following the detailed instructions quickly and easily. Coast is a women’s clothing store that sells clothes for all manner of special occasions – from bridesmaid’s outfits to something for a birthday party, prom or drinks with friends – Coast champion the new rules of dressing up. Having been on the high street since 1996, Coast aim to design seemingly effortless looks which complement individual personality. Coast have stand-alone stores and concessions within major department stores including John Lewis and Debenhams. Click here to find your nearest Coast store. Coast’s gift cards may only be redeemed in their own stores or on their own website. Where can I check my Coast Giftcard Balance online? You can check your Coasy gift card balance online any time of the day or night. It is a bit fiddly though – you need to access the checkout process in order to find the balance checker. Click here to view the basket page (opens in a new tab) then see the screenshot below for the location of the balance checker. You’ll need the long card number from the back of the card (this will start with 6338 and is printed above the barcode on the back of the card) and a PIN number which can be found under a scratch-off panel, also on the back of the card. Where can I spend my Coast Giftcard? You can spend your Coast gift card at any stand-alone Coast store in the UK. Click here to find your nearest Coast store. Note that the cards cannot be used at Coast concessions within department stores, or any Coast outlet store. You can also spend the card online at the Coast website. Where can I buy a Coast Giftcard? 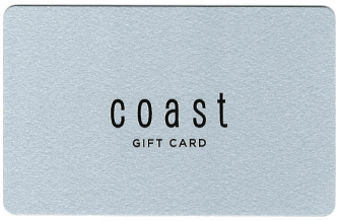 Coast gift cards are available at any Coast store in the UK. Click here to find your nearest Coast store. Alternatively, they are also available to buy online (delivery charges from £2.50) via the Official Coast Giftcard website. Does a Coast Giftcard expire? Your Coast gift card will expire 24 months after the last use. This includes ‘topping up’ the card, which can be done at any Coast store. If you are concerned that the card will expire you can extend the validity by topping up in store. If the card is allowed to expire, you will lose any remaining balance left on it.